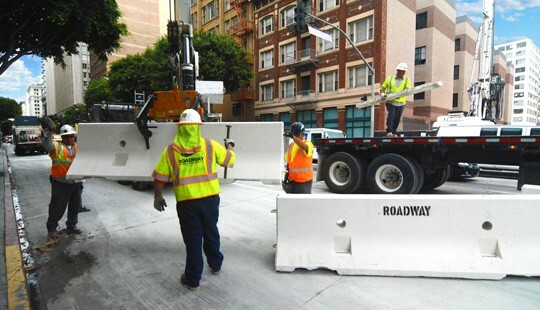 Roadway Construction Service (RCS) is a premier traffic control company in Southern California, we often employ the Jersey barrier to help maintain orderly roads and highways. The Jersey barrier is alternately known as k-rail. This protective wall reigns as the strongest and most effective of all traffic control barriers. One look at its construction will reveal why. This is no lightweight. A Jersey barrier typically is made of modular concrete or high-strength plastic. This innate strength makes k-rail an obvious choice when construction projects require the re-routing of vehicles and pedestrians. Very little gets past the impenetrable Jersey wall. Sometimes, of course, mistakes happen. K-rail construction takes this possibility into account. Accordingly, the might Jersey barrier is designed to minimize vehicle damage should inadvertent contact occur. Clearly, the Jersey wall is the perfect synthesis of strong and gentle. The deployment of Jersey barriers is an integral part of our traffic control planning. It has to be. As with every other service provided by our traffic control company, the setting up of these traffic safety barricades is no random act. Our planning team must consider countless details to maximize the safety of construction sites, as well as the efficiency of traffic flow. You don’t just drop ‘em and leave. To meet the stringent requirement of k-rail deployment, we’ve developed an advanced system of k-rail management. When our team places a Jersey barrier on a busy roadway, the operation takes place only after painstaking strategizing. Our strategies factor in countless valuables, included expected traffic flow and the number of pedestrians – both of which likely will vary by time of day. Location of construction crews and meteorological conditions also come into play. Our record speaks for itself. Roadway Construction Service maximizes safety and efficiency on every project we tackle. There are many reasons we consistently hit this high mark. One reason is our effective deployment of water-filled traffic barriers. As the term implies, water-filled traffic barriers rely on H2O to do their job. Basically, each barricade is a sturdy plastic shell filled with water. Gallons of it. The liquid filler provides substantial strength, as well as resilience not found in heavier solid concrete barriers. Most commonly, water-filled barricades are utilized for construction and resurfacing projects. As with traditional barricades, they are available in a range of sizes and types, each one geared to specific needs. Water-filled road traffic barriers, or K-rail, are the largest and mightiest of the group. Essentially, these are protective walls designed to prevent the accidental entry of vehicles into restricted areas. The wall is created by interlocking plastic segments spanning a specified distance. On the other end of the spectrum is light duty water-filled traffic barriers. These may be used to guide vehicles and pedestrians around traffic zones or to prevent unwanted intrusions. Water-filled traffic barriers offer many advantages not provided by the concrete variety. The most important of these is improved safety for drivers. Compared with concrete barricades, impacts are considerably lower with molded plastic barricades filled with a resilient fluid. Color also plays a role in the superior safety of plastic, water-filled traffic barricades. Often these barriers scream bright orange, making them very noticeable to motorists – even at a distance. That’s a whole lot of built-in protection. But for Roadway Construction Service, you never can be too safe. Which is why we complement barricade deployment with the best-trained, sharpest-eyed flaggers in the business. Certified to the highest standards, such as OSHA, these experts extend the protection of barriers to the highest level. Double-protection, you might call it. Clearly, water-filled road barricades maximize safety on many levels. But what about efficiency? Again, plastic trumps concrete. Molded plastic barricades are comparatively lightweight (yet strong). Consequently, crews can transport them to work sites with fewer hassles and greater speed. Should ballast be required, consider the problem solved. It’s a simple matter to add ballast on site. Equally simple is the assembly process. No instructions needed. Crews merely connect a series of interlocking segments to form the desired length. Now combine quick assembly with easy transport and you get major time savings – and as result, major money savings. In your pocket instead of out the door. Safety and efficiency are standout benefits of water-filled traffic barriers. For this reason, Roadway Construction Service focuses considerable attention on effective traffic barricade strategies. To learn more, reach out to our team any time. We’ll be happy to provide additional information and answers to all your questions. Once we’ve developed a satisfactory plan for k-rail deployment, we’re still not ready to move. Our team must first obtain the necessary traffic control permits from appropriate municipal authorities. These officials evaluate every traffic control plan for soundness and safety. All strategic components, including Jersey barriers and other traffic safety barricades, must meet their approval. Thus, our k-rail management team must be on their toes. It’s the only way to cover the gamut of important details and contingencies with flawless precision. We’re pleased to say we always come through – without any barriers.